A pewter tea set is also called a pewter tea service. Typically a set will include a tray, several cups and a teapot, all made of pewter. A set like this makes a real fine drinkware. It lends an elegance to your dining table, especially when the set is new and shining. The set I have is very old and can be considered antique. It was supposedly from the 1950s, but I have no idea yet how to verify that. See the picture of the tray and tea cups below. The tray is rather small and could only fit the four cups. All of them have the hammered surface finish. I think they are in relatively good condition considering the age. I didn't have too much trouble cleaning them up after getting hold of them. The outside of the cups is generally worse off than the inner areas which still has the lustrous shine of new pewter on most parts. 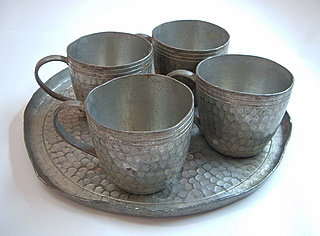 This set looks like an oriental pewter tea set because the cups are small and are of similar size to ceramic cups used for drinking Chinese tea. The opening of each cup measures 6cm and has a height of 5.5cm. The obvious difference it has compared with the Chinese tea cup is the handle, which isn't normally found. 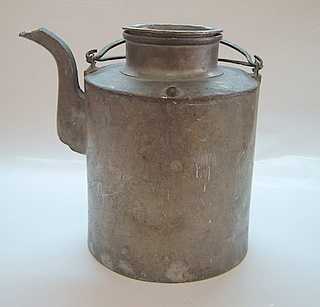 But for a cup made of metal, a handle is needed since the tea is usually consumed hot. It's not a good idea to get the user's hands burnt. Oh, this set also comes with a pewter teapot, shown below. I'm actually skeptical that this teapot comes as a set with the tray and cups because it doesn't have the hammered finish. But since I have no way of verifying that, I'm giving the benefit of the doubt to the trader who sold them to me in a set. This teapot is also very much of an oriental design, similar to porcelain teapots used in the 1970s or earlier. I know this because I remember my grandmother using one like this when I was a kid. When I got it, the condition wasn't the very best. Certain areas of the bottom have already corroded and holes have appeared. The spout was initially blocked by some dirt and I had to remove it. A simple push with a cotton bud did the trick. But cleaning it was tough. I wasn't keen to do it but I felt that I had to, since it was quite dirty. I could only rinse the inside as my hand couldn't get in there and I didn't want to over-clean it with a brush. So a quick wash with mild soap and water on the outside, and rinsing and flushing on the inside and the spout was what I did. After all the washing, I dried it with a soft cloth and then a hairdryer. This was especially useful for the inside and the spout since I couldn't reach it with a cloth and I didn't want to leave those areas wet for too long. I used the lowest heating level, so patience was very important. Anyway, now they're clean and dry, and they sit nicely in my display cabinet. Besides this pewter tea set, you can also check out other pewter drinkware on this website.